I was browsing along the Etsy website the other day and happened to stumble upon Francis Audelos's Etsy page. As I toured her online inventory I was taken away by all her beautiful feather work. 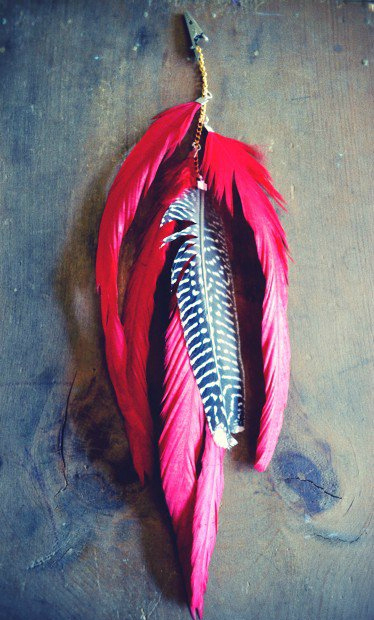 Francis is a California girl who creates these bohemian like feathered clips, earings, necklaces & feather ear cuffs, due to a unique passion she cultivates with nature in which she has begun to share with the rest of the world. I was so intrigued I figured why not share her with all our Inspirer.nu readers. Q All your little creations are so bohemian chic! How did you get started? A Well, By: Francis Frank started in December 2010 I've always creating whether is acting, music or crafts. I've always had a active lifestyle when It came to the arts. So, after my previous business fancyThat had hit it's end in being creative I started designing for myself and friends and I put a couple of designs on Etsy and they sold within minutes and from there it took off like wild fire. Q How would you describe the style of your pieces? A I think the style of my line is very bohemian to a natural and native American sense, from colors to patterns and materials I use. I design very down to earth pieces that can also be dressed up and at the same time always keeping in mind what the consumer might want. Q What inspired you to adopt this style? A Throughout the years I've adopted a natural style of my own, long messy hair and oversized t-shirts. I wanted to design a line for girls like me and for the girls who wanted to dress up. Just living in L.A you can instantly be inspired by walking out the door. Q What is your most favorite color to work with? A Favorite colors I love to work with are natural like browns, white, grays, iridescent black, but I also like to work with funky colors as the seasons change. Q As for the feathers you use, are there different types of feathers? For example do some feathers come in different materials then others? A I work with many types of feathers, from peacock feathers to pheasant, tail feathers, and iridescent. I love working with all sorts to create different looks. I also only have one vendor I get my supplies from and have a very good relationship with this person to make sure that there is no animal cruelty involved. Q Do you color the feathers yourself? A I use to hand dye feathers myself, but I wasn't very good (haha) at it so now I have my vendor do it. Q In your profile you stated “Francis Frank is a separate line from fancyThat accessories”, what makes Francis Frank different from fancythataccessories? And why did you make the decision to make the two separate lines? A Well, I started fancyThat accessories in late 2007 which was a line dedicated to "Old Hollywood". Being obsessed as I am with certain eras like 20's -50's I started creating vintage inspired feather fascinators using vintage buttons and vintage findings I'd find through my travels. But as trends changed so did I.. I wanted to created a line that I myself could wear. Even though I loved fancyThat and It was a very successful business, I felt that I created everything I possible could. So, in December of 2010 I said goodbye to fancyThat and hello to By: Francis Frank. Q How has Etsy.com helped the growth of your business? A Etsy has helped tremendously they have such a huge audience I was able to connect with people all over the world and sell to so many unique individuals and even getting my designs sold across the world in boutiques is very rewarding and I wouldn't be able to do that without Etsy. Q I understand you make each piece by hand which is beautiful, do you create from home or do you have a particular place of peace where you go to craft? A Right now I create at home, I'm pretty obsessed with crafting stations so I'm actually looking for a bigger place to live so I could go nuts with decorating for a craft space. Q Do you have a blog or other website besides Etsy where your clients can look at your work? For more By: Francis Frank, go to Etsy.com to see full inventory & prices.